Growing up in Paris my lunches would often consist of a big slice of Quiche and a green salad on the side.. It’s a delicious meal for lunch or dinner, and even though some people shy away from making their own pastry, this Pâte Brisée is very simple to make.. In a food processor add all the pastry ingredients and blend until the dough resembles breadcrumbs.. Place it on your work surface and combine all ingredients well without over-kneading.. Roll out the dough (using a little flour if it sticks) and place it in a tart base.. Refrigerate for about an hour..
Preheat the oven to 220C.. Sauté the mushrooms and tomatoes in a pan with some olive oil to give them some flavor, add pepper (no salt as feta is usually already salty) and set aside.. 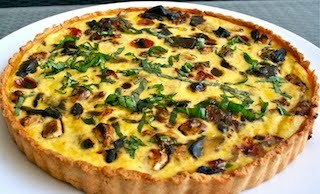 In a bowl mix the eggs, yolks, cream, nutmeg and cracked pepper..
Brush the pastry with egg yolk.. Now place the feta, mushroom & tomatoes in the pastry and pour in the egg mixture.. Bake for 10 minutes, then lower the heat to 180C and bake for another 25-30 minutes.. Remove your Quiche when it's golden, chop up some basil leaves to sprinkle on top and drizzle with some olive oil.. Serve with a green salad.. Enjoy!